Not For Us Alone, a sampler by Amy Mitten, was up during the last rotation spot. I started this as a SAL with Ellen Chester's Samplerband and, of course, other projects and life got in the way before I got very far. This patterns for this design come in seven chapters and each chapter has part of a mystery. The chart is easy to read and the fibers are wonderful. This design has lots of Montenegrin stitch, as many of Amy's designs seem to have. I bought her book, Autopsy of the Montenegrin Stitch, and the diagrams are a great help. Here's my progress on Chapter 2. I paid a visit to my local quilt shop on Saturday to pick up my block of the month. 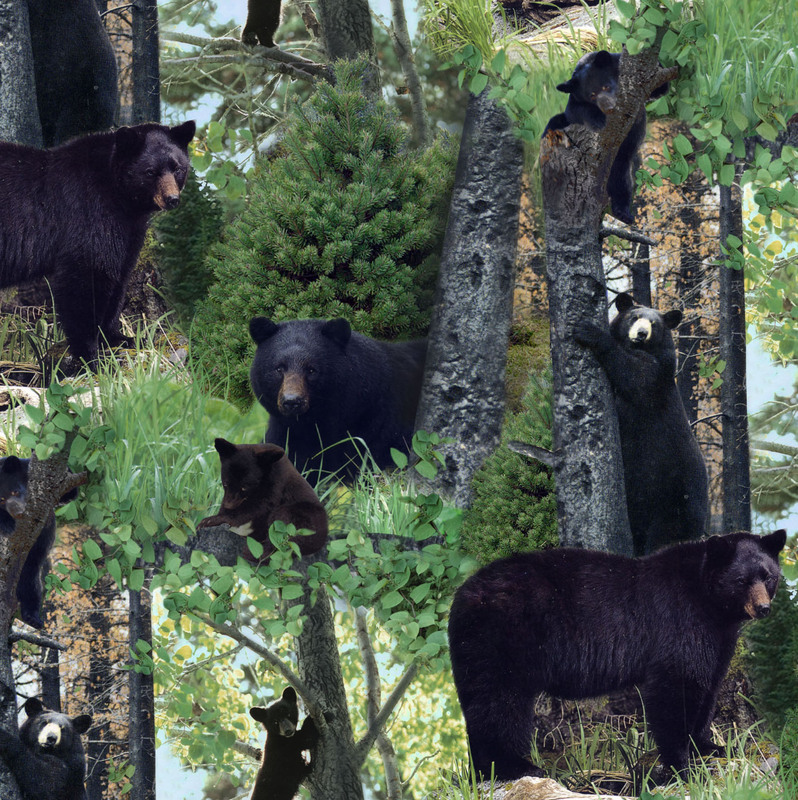 While I was there, I spotted this fabric, and thought it would be perfect as the backing for a quilt for my son. He'll be working at a camp this summer that adjoins a state park where black bears are often sighted. Alas, there were only two yards left. The shop owner will be searching out more for me. I've been thinking about starting a blog for several months, but hestitated for several reasons. First of all, I couldn't think of a name! Inspiration hit this morning and this blog has begun. I intend to use these pages to talk mostly about my addiction to--um, I mean passion for--cross stitch and quilting, but I'll also share other thoughts about life and events in my family. I'm looking forward to this new adventure!